The ANC took a political gamble by increasing sales tax ahead of elections next year as new President Cyril Ramaphosa seeks to stabilise debt and prevent a third junk credit rating. The value-added tax rate will be raised to 15% from 14%, the first time since the end of apartheid that the government has targeted a charge seen as hitting the poor hardest. Levies on fuel and luxury goods will go up, while spending will be pared back over the next three years, according to finance minister Malusi Gigaba. The rand and government bonds gained. The first increase in the sales tax since 1993 comes just over a year before national elections and could backfire on the ANC because it will be seen to be hitting its largely poor and middle-class supporters. The ruling party may be banking on stronger growth this year boosting income, allowing it to provide relief and placate voters in next year’s budget. Labour unions that backed Ramaphosa’s campaign to win control of the ANC in December vigorously opposed a VAT increase, arguing that the government should target wasteful spending instead. Ramaphosa was elected president last week, a day after his party forced Jacob Zuma to quit following a scandal-marred nine-year tenure during which economic growth stagnated. Higher taxes will raise an additional R36bn in the year to March 2019 and be coupled with budget cuts totaling R85bn over three years. National treasury expects those measures, together with an improved economic growth outlook, to narrow the budget deficit to 3.6% of GDP in the coming fiscal year, from 4.3% now.Forecasts in October that projected gross debt ballooning to more than 60% of GDP were pared back. That may appease rating companies that have steadily downgraded the nation and help ward off a cut to junk next month by Moody’s Investors Service. Moody’s is the only major company that still ranks South Africa’s debt at investment grade after S&P Global Ratings and Fitch Ratings punished the country in 2017 following political changes that sapped confidence and knocked financial markets. Benchmark bond yields fell 12 basis points to 7.98%, dropping below 8% for the first time since May 2015, while the rand gained 0.7% to R11.65/US$ by 2.38pm in Johannesburg, the best performer among major peers on Wednesday. Better sentiment since Ramaphosa took over leadership of the ruling party, and the government, is expected to help lift economic growth. The treasury forecasts a 1.5% expansion this year, up from the October forecast of 1.1%. 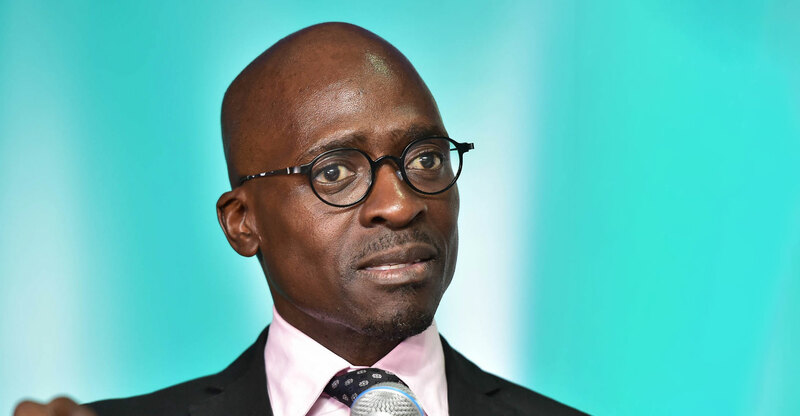 The annual budget speech could be Gigaba’s first and last with Ramaphosa widely expected to replace him and several other Zuma appointees in a cabinet reshuffle. The budget allocates an additional R57bn over the next three years to finance a plan announced by Zuma late last year to fund free post-school education for poor students. There was also an extra R6bn for drought relief and another R4.2bn for a national health insurance plan. The budget didn’t promise any additional funding for cash-strapped state-owned companies, although provisions could still be made and financed by selling about R40bn worth of state properties.